One of the most powerful parts of Django is the automatic admin interface. It reads metadata from your models to provide a quick, model-centric interface where trusted users can manage content on your site. The admin’s recommended use is limited to an organization’s internal management tool. It’s not intended for building your entire front end around. The admin has many hooks for customization, but beware of trying to use those hooks exclusively. If you need to provide a more process-centric interface that abstracts away the implementation details of database tables and fields, then it’s probably time to write your own views. In this document we discuss how to activate, use, and customize Django’s admin interface. The admin is enabled in the default project template used by startproject. Add 'django.contrib.admin' to your INSTALLED_APPS setting. The admin has four dependencies - django.contrib.auth, django.contrib.contenttypes, django.contrib.messages and django.contrib.sessions. If these applications are not in your INSTALLED_APPS list, add them. Determine which of your application’s models should be editable in the admin interface. For each of those models, optionally create a ModelAdmin class that encapsulates the customized admin functionality and options for that particular model. Instantiate an AdminSite and tell it about each of your models and ModelAdmin classes. Hook the AdminSite instance into your URLconf. After you’ve taken these steps, you’ll be able to use your Django admin site by visiting the URL you hooked it into (/admin/, by default). If you need to create a user to login with, you can use the createsuperuser command. Having problems? Try FAQ: The admin. Do you need a ModelAdmin object at all? You can’t use this decorator if you have to reference your model admin class in its __init__() method, e.g. super(PersonAdmin, self).__init__(*args, **kwargs). If you are using Python 3 and don’t have to worry about supporting Python 2, you can use super().__init__(*args, **kwargs) . Otherwise, you’ll have to use admin.site.register() instead of this decorator. When you put 'django.contrib.admin' in your INSTALLED_APPS setting, Django automatically looks for an admin module in each application and imports it. This is the default AppConfig class for the admin. It calls autodiscover() when Django starts. This class works like AdminConfig, except it doesn’t call autodiscover(). This function attempts to import an admin module in each installed application. Such modules are expected to register models with the admin. Typically you won’t need to call this function directly as AdminConfig calls it when Django starts. If you are using a custom AdminSite, it is common to import all of the ModelAdmin subclasses into your code and register them to the custom AdminSite. In that case, in order to disable auto-discovery, you should put 'django.contrib.admin.apps.SimpleAdminConfig' instead of 'django.contrib.admin' in your INSTALLED_APPS setting. A list of actions to make available on the change list page. See Admin actions for details. Controls where on the page the actions bar appears. By default, the admin changelist displays actions at the top of the page (actions_on_top = True; actions_on_bottom = False). Controls whether a selection counter is displayed next to the action dropdown. By default, the admin changelist will display it (actions_selection_counter = True). Set date_hierarchy to the name of a DateField or DateTimeField in your model, and the change list page will include a date-based drilldown navigation by that field. This will intelligently populate itself based on available data, e.g. if all the dates are in one month, it’ll show the day-level drill-down only. date_hierarchy uses QuerySet.datetimes() internally. Please refer to its documentation for some caveats when time zone support is enabled (USE_TZ = True). This attribute, if given, should be a list of field names to exclude from the form. Since the Author model only has three fields, name, title, and birth_date, the forms resulting from the above declarations will contain exactly the same fields. In the above example, only the fields url, title and content will be displayed, sequentially, in the form. fields can contain values defined in ModelAdmin.readonly_fields to be displayed as read-only. For more complex layout needs, see the fieldsets option. The fields option, unlike list_display, may only contain names of fields on the model or the form specified by form. It may contain callables only if they are listed in readonly_fields. This fields option should not be confused with the fields dictionary key that is within the fieldsets option, as described in the next section. If neither fields nor fieldsets options are present, Django will default to displaying each field that isn’t an AutoField and has editable=True, in a single fieldset, in the same order as the fields are defined in the model. Set fieldsets to control the layout of admin “add” and “change” pages. The two-tuples are in the format (name, field_options), where name is a string representing the title of the fieldset and field_options is a dictionary of information about the fieldset, including a list of fields to be displayed in it. If neither fieldsets nor fields options are present, Django will default to displaying each field that isn’t an AutoField and has editable=True, in a single fieldset, in the same order as the fields are defined in the model. A tuple of field names to display in this fieldset. This key is required. fields can contain values defined in readonly_fields to be displayed as read-only. If you add the name of a callable to fields, the same rule applies as with the fields option: the callable must be listed in readonly_fields. A list or tuple containing extra CSS classes to apply to the fieldset. Two useful classes defined by the default admin site stylesheet are collapse and wide. Fieldsets with the collapse style will be initially collapsed in the admin and replaced with a small “click to expand” link. Fieldsets with the wide style will be given extra horizontal space. A string of optional extra text to be displayed at the top of each fieldset, under the heading of the fieldset. This string is not rendered for TabularInline due to its layout. Note that this value is not HTML-escaped when it’s displayed in the admin interface. This lets you include HTML if you so desire. Alternatively you can use plain text and django.utils.html.escape() to escape any HTML special characters. Same as filter_horizontal, but uses a vertical display of the filter interface with the box of unselected options appearing above the box of selected options. By default a ModelForm is dynamically created for your model. It is used to create the form presented on both the add/change pages. You can easily provide your own ModelForm to override any default form behavior on the add/change pages. Alternatively, you can customize the default form rather than specifying an entirely new one by using the ModelAdmin.get_form() method. For an example see the section Adding custom validation to the admin. If you define the Meta.model attribute on a ModelForm, you must also define the Meta.fields attribute (or the Meta.exclude attribute). However, since the admin has its own way of defining fields, the Meta.fields attribute will be ignored. If the ModelForm is only going to be used for the admin, the easiest solution is to omit the Meta.model attribute, since ModelAdmin will provide the correct model to use. Alternatively, you can set fields =  in the Meta class to satisfy the validation on the ModelForm. In the above example, the “age” field will be excluded but the “name” field will be included in the generated form. This provides a quick-and-dirty way to override some of the Field options for use in the admin. formfield_overrides is a dictionary mapping a field class to a dict of arguments to pass to the field at construction time. Note that the key in the dictionary is the actual field class, not a string. The value is another dictionary; these arguments will be passed to the form field’s __init__() method. See The Forms API for details. If you want to use a custom widget with a relation field (i.e. ForeignKey or ManyToManyField), make sure you haven’t included that field’s name in raw_id_fields or radio_fields. formfield_overrides won’t let you change the widget on relation fields that have raw_id_fields or radio_fields set. That’s because raw_id_fields and radio_fields imply custom widgets of their own. See InlineModelAdmin objects below as well as ModelAdmin.get_formsets_with_inlines(). Set list_display to control which fields are displayed on the change list page of the admin. If you don’t set list_display, the admin site will display a single column that displays the __str__() (__unicode__() on Python 2) representation of each object. If the field is a ForeignKey, Django will display the __str__() (__unicode__() on Python 2) of the related object. If the field is a BooleanField or NullBooleanField, Django will display a pretty “on” or “off” icon instead of True or False. If the string given is a method of the model, ModelAdmin or a callable, Django will HTML-escape the output by default. To escape user input and allow your own unescaped tags, use format_html(). Deprecated since version 1.9: In older versions, you could add an allow_tags attribute to the method to prevent auto-escaping. This attribute is deprecated as it’s safer to use format_html(), format_html_join(), or mark_safe() instead. The ability to customize empty_value_display was added. If the string given is a method of the model, ModelAdmin or a callable that returns True or False Django will display a pretty “on” or “off” icon if you give the method a boolean attribute whose value is True. Usually, elements of list_display that aren’t actual database fields can’t be used in sorting (because Django does all the sorting at the database level). However, if an element of list_display represents a certain database field, you can indicate this fact by setting the admin_order_field attribute of the item. The above will tell Django to order by the first_name field when trying to sort by colored_first_name in the admin. Elements of list_display can also be properties. Please note however, that due to the way properties work in Python, setting short_description on a property is only possible when using the property() function and not with the @property decorator. my_property.short_description = "Full name of the person"
The field names in list_display will also appear as CSS classes in the HTML output, in the form of column-<field_name> on each <th> element. This can be used to set column widths in a CSS file for example. A field of the model. A string representing a ModelAdmin attribute. A string representing a model attribute. For example if you have first_name as a model field and as a ModelAdmin attribute, the model field will be used. Use list_display_links to control if and which fields in list_display should be linked to the “change” page for an object. Set it to None to get no links at all. Set it to a list or tuple of fields (in the same format as list_display) whose columns you want converted to links. You can specify one or many fields. As long as the fields appear in list_display, Django doesn’t care how many (or how few) fields are linked. The only requirement is that if you want to use list_display_links in this fashion, you must define list_display. Set list_editable to a list of field names on the model which will allow editing on the change list page. That is, fields listed in list_editable will be displayed as form widgets on the change list page, allowing users to edit and save multiple rows at once. Any field in list_editable must also be in list_display. You can’t edit a field that’s not displayed! The same field can’t be listed in both list_editable and list_display_links – a field can’t be both a form and a link. You’ll get a validation error if either of these rules are broken. # right admin sidebar just above the filter options. # Parameter for the filter that will be used in the URL query. # to decide how to filter the queryset. anyone born in the corresponding decades. Assuming author is a ForeignKey to a User model, this will limit the list_filter choices to the users who have written a book instead of listing all users. The FieldListFilter API is considered internal and might be changed. See the default template provided by django (admin/filter.html) for a concrete example. Set list_max_show_all to control how many items can appear on a “Show all” admin change list page. The admin will display a “Show all” link on the change list only if the total result count is less than or equal to this setting. By default, this is set to 200. Set list_per_page to control how many items appear on each paginated admin change list page. By default, this is set to 100. Set list_select_related to tell Django to use select_related() in retrieving the list of objects on the admin change list page. This can save you a bunch of database queries. The value should be either a boolean, a list or a tuple. Default is False. When value is True, select_related() will always be called. When value is set to False, Django will look at list_display and call select_related() if any ForeignKey is present. If you need to specify a dynamic value based on the request, you can implement a get_list_select_related() method. Set ordering to specify how lists of objects should be ordered in the Django admin views. This should be a list or tuple in the same format as a model’s ordering parameter. If this isn’t provided, the Django admin will use the model’s default ordering. If you need to specify a dynamic order (for example depending on user or language) you can implement a get_ordering() method. The paginator class to be used for pagination. By default, django.core.paginator.Paginator is used. If the custom paginator class doesn’t have the same constructor interface as django.core.paginator.Paginator, you will also need to provide an implementation for ModelAdmin.get_paginator(). prepopulated_fields doesn’t accept DateTimeField, ForeignKey, nor ManyToManyField fields. The admin now preserves filters on the list view after creating, editing or deleting an object. You can restore the previous behavior of clearing filters by setting this attribute to False. You have the choice of using HORIZONTAL or VERTICAL from the django.contrib.admin module. Don’t include a field in radio_fields unless it’s a ForeignKey or has choices set. By default, Django’s admin uses a select-box interface (<select>) for fields that are ForeignKey. Sometimes you don’t want to incur the overhead of having to select all the related instances to display in the drop-down. By default the admin shows all fields as editable. Any fields in this option (which should be a list or tuple) will display its data as-is and non-editable; they are also excluded from the ModelForm used for creating and editing. Note that when specifying ModelAdmin.fields or ModelAdmin.fieldsets the read-only fields must be present to be shown (they are ignored otherwise). If readonly_fields is used without defining explicit ordering through ModelAdmin.fields or ModelAdmin.fieldsets they will be added last after all editable fields. Set save_as to enable a “save as new” feature on admin change forms. Normally, objects have three save options: “Save”, “Save and continue editing”, and “Save and add another”. If save_as is True, “Save and add another” will be replaced by a “Save as new” button that creates a new object (with a new ID) rather than updating the existing object. By default, save_as is set to False. Set save_on_top to add save buttons across the top of your admin change forms. Normally, the save buttons appear only at the bottom of the forms. If you set save_on_top, the buttons will appear both on the top and the bottom. By default, save_on_top is set to False. Set search_fields to enable a search box on the admin change list page. This should be set to a list of field names that will be searched whenever somebody submits a search query in that text box. This query is more efficient than the normal '%john%' query, because the database only needs to check the beginning of a column’s data, rather than seeking through the entire column’s data. Plus, if the column has an index on it, some databases may be able to use the index for this query, even though it’s a LIKE query. Note that the query input is split by spaces, so, following this example, it’s currently not possible to search for all records in which first_name is exactly 'john winston' (containing a space). Using the ‘@’ operator to perform a full text match. This is like the default search method but uses an index. Currently this is only available for MySQL. If you need to customize search you can use ModelAdmin.get_search_results() to provide additional or alternate search behavior. Set show_full_result_count to control whether the full count of objects should be displayed on a filtered admin page (e.g. 99 results (103 total)). If this option is set to False, a text like 99 results (Show all) is displayed instead. The default of show_full_result_count=True generates a query to perform a full count on the table which can be expensive if the table contains a large number of rows. Set view_on_site to control whether or not to display the “View on site” link. This link should bring you to a URL where you can display the saved object. This value can be either a boolean flag or a callable. If True (the default), the object’s get_absolute_url() method will be used to generate the url. Path to a custom template, used by add_view(). Path to a custom template, used by change_view(). Path to a custom template, used by changelist_view(). Path to a custom template, used by delete_view() for displaying a confirmation page when deleting one or more objects. Path to a custom template, used by the delete_selected action method for displaying a confirmation page when deleting one or more objects. See the actions documentation. Path to a custom template, used by history_view(). ModelAdmin.save_model() and ModelAdmin.delete_model() must save/delete the object, they are not for veto purposes, rather they allow you to perform extra operations. The save_model method is given the HttpRequest, a model instance, a ModelForm instance and a boolean value based on whether it is adding or changing the object. Here you can do any pre- or post-save operations. The delete_model method is given the HttpRequest and a model instance. Use this method to do pre- or post-delete operations. The save_formset method is given the HttpRequest, the parent ModelForm instance and a boolean value based on whether it is adding or changing the parent object. See also Saving objects in the formset. The get_search_results method modifies the list of objects displayed into those that match the provided search term. It accepts the request, a queryset that applies the current filters, and the user-provided search term. It returns a tuple containing a queryset modified to implement the search, and a boolean indicating if the results may contain duplicates. The default implementation searches the fields named in ModelAdmin.search_fields. This method may be overridden with your own custom search method. For example, you might wish to search by an integer field, or use an external tool such as Solr or Haystack. You must establish if the queryset changes implemented by your search method may introduce duplicates into the results, and return True in the second element of the return value. This implementation is more efficient than search_fields = ('name', '=age') which results in a string comparison for the numeric field, for example ... OR UPPER("polls_choice". "votes"::text) = UPPER('4') on PostgreSQL. The save_related method is given the HttpRequest, the parent ModelForm instance, the list of inline formsets and a boolean value based on whether the parent is being added or changed. Here you can do any pre- or post-save operations for objects related to the parent. Note that at this point the parent object and its form have already been saved. The get_readonly_fields method is given the HttpRequest and the obj being edited (or None on an add form) and is expected to return a list or tuple of field names that will be displayed as read-only, as described above in the ModelAdmin.readonly_fields section. The get_prepopulated_fields method is given the HttpRequest and the obj being edited (or None on an add form) and is expected to return a dictionary, as described above in the ModelAdmin.prepopulated_fields section. The get_list_display method is given the HttpRequest and is expected to return a list or tuple of field names that will be displayed on the changelist view as described above in the ModelAdmin.list_display section. The get_list_display_links method is given the HttpRequest and the list or tuple returned by ModelAdmin.get_list_display(). It is expected to return either None or a list or tuple of field names on the changelist that will be linked to the change view, as described in the ModelAdmin.list_display_links section. The get_fields method is given the HttpRequest and the obj being edited (or None on an add form) and is expected to return a list of fields, as described above in the ModelAdmin.fields section. The get_fieldsets method is given the HttpRequest and the obj being edited (or None on an add form) and is expected to return a list of two-tuples, in which each two-tuple represents a <fieldset> on the admin form page, as described above in the ModelAdmin.fieldsets section. The get_list_filter method is given the HttpRequest and is expected to return the same kind of sequence type as for the list_filter attribute. The get_list_select_related method is given the HttpRequest and should return a boolean or list as ModelAdmin.list_select_related does. The get_search_fields method is given the HttpRequest and is expected to return the same kind of sequence type as for the search_fields attribute. If you override this method, make sure that the returned inlines are instances of the classes defined in inlines or you might encounter a “Bad Request” error when adding related objects. # Include common variables for rendering the admin template. Notice that the custom patterns are included before the regular admin URLs: the admin URL patterns are very permissive and will match nearly anything, so you’ll usually want to prepend your custom URLs to the built-in ones. It will not perform any permission checks, so it will be accessible to the general public. It will not provide any header details to prevent caching. This means if the page retrieves data from the database, and caching middleware is active, the page could show outdated information. This wrapping will protect self.my_view from unauthorized access and will apply the django.views.decorators.cache.never_cache() decorator to make sure it is not cached if the cache middleware is active. ModelAdmin views have model_admin attributes. Other AdminSite views have admin_site attributes. Returns a ModelForm class for use in the admin add and change views, see add_view() and change_view(). You may also simply return a custom ModelForm class directly. Yields (FormSet, InlineModelAdmin) pairs for use in admin add and change views. This uses the HttpRequest instance to filter the Car foreign key field to only display the cars owned by the User instance. Any choices attribute set on the formfield will be limited to the form field only. If the corresponding field on the model has choices set, the choices provided to the form must be a valid subset of those choices, otherwise the form submission will fail with a ValidationError when the model itself is validated before saving. Returns the Changelist class to be used for listing. By default, django.contrib.admin.views.main.ChangeList is used. By inheriting this class you can change the behavior of the listing. If you define the Meta.model attribute on a ModelForm, you must also define the Meta.fields attribute (or the Meta.exclude attribute). However, ModelAdmin ignores this value, overriding it with the ModelAdmin.list_editable attribute. The easiest solution is to omit the Meta.model attribute, since ModelAdmin will provide the correct model to use. Should return True if adding an object is permitted, False otherwise. Should return True if editing obj is permitted, False otherwise. If obj is None, should return True or False to indicate whether editing of objects of this type is permitted in general (e.g., False will be interpreted as meaning that the current user is not permitted to edit any object of this type). Should return True if deleting obj is permitted, False otherwise. If obj is None, should return True or False to indicate whether deleting objects of this type is permitted in general (e.g., False will be interpreted as meaning that the current user is not permitted to delete any object of this type). Should return True if displaying the module on the admin index page and accessing the module’s index page is permitted, False otherwise. Uses User.has_module_perms() by default. Overriding it does not restrict access to the add, change or delete views, has_add_permission(), has_change_permission(), and has_delete_permission() should be used for that. Sends a message to the user using the django.contrib.messages backend. See the custom ModelAdmin example. Keyword arguments allow you to change the message level, add extra CSS tags, or fail silently if the contrib.messages framework is not installed. These keyword arguments match those for django.contrib.messages.add_message(), see that function’s documentation for more details. One difference is that the level may be passed as a string label in addition to integer/constant. Returns an instance of the paginator to use for this view. By default, instantiates an instance of paginator. Determines the HttpResponse for the add_view() stage. response_add is called after the admin form is submitted and just after the object and all the related instances have been created and saved. You can override it to change the default behavior after the object has been created. Determines the HttpResponse for the change_view() stage. response_change is called after the admin form is submitted and just after the object and all the related instances have been saved. You can override it to change the default behavior after the object has been changed. Determines the HttpResponse for the delete_view() stage. response_delete is called after the object has been deleted. You can override it to change the default behavior after the object has been deleted. obj_display is a string with the name of the deleted object. obj_id is the serialized identifier used to retrieve the object to be deleted. The obj_id parameter was added. A hook for the initial data on admin change forms. By default, fields are given initial values from GET parameters. For instance, ?name=initial_value will set the name field’s initial value to be initial_value. Django view for the model instance addition page. See note below. Django view for the model instance editing page. See note below. Django view for the model instances change list/actions page. See note below. Django view for the model instance(s) deletion confirmation page. See note below. Django view for the page that shows the modification history for a given model instance. Unlike the hook-type ModelAdmin methods detailed in the previous section, these five methods are in reality designed to be invoked as Django views from the admin application URL dispatching handler to render the pages that deal with model instances CRUD operations. As a result, completely overriding these methods will significantly change the behavior of the admin application. These views return TemplateResponse instances which allow you to easily customize the response data before rendering. For more details, see the TemplateResponse documentation. The staticfiles app prepends STATIC_URL (or MEDIA_URL if STATIC_URL is None) to any asset paths. The same rules apply as regular asset definitions on forms. The embedded jQuery has been upgraded from 1.9.1 to 1.11.2. The embedded jQuery has been upgraded from 1.11.2 to 2.1.4. This drops support for Internet Explorer 8 and below. You can restore support by including your own version of jQuery 1.X. The ModelAdmin class requires jQuery by default, so there is no need to add jQuery to your ModelAdmin’s list of media resources unless you have a specific need. For example, if you require the jQuery library to be in the global namespace (for example when using third-party jQuery plugins) or if you need a newer version of jQuery, you will have to include your own copy. Django provides both uncompressed and ‘minified’ versions of jQuery, as jquery.js and jquery.min.js respectively. It is important you use a ModelForm here otherwise things can break. See the forms documentation on custom validation and, more specifically, the model form validation notes for more information. The difference between these two is merely the template used to render them. The model which the inline is using. This is required. The name of the foreign key on the model. In most cases this will be dealt with automatically, but fk_name must be specified explicitly if there are more than one foreign key to the same parent model. This defaults to BaseInlineFormSet. Using your own formset can give you many possibilities of customization. Inlines are built around model formsets. The value for form defaults to ModelForm. This is what is passed through to inlineformset_factory() when creating the formset for this inline. When writing custom validation for InlineModelAdmin forms, be cautious of writing validation that relies on features of the parent model. If the parent model fails to validate, it may be left in an inconsistent state as described in the warning in Validation on a ModelForm. This controls the number of extra forms the formset will display in addition to the initial forms. See the formsets documentation for more information. InlineModelAdmin.get_extra() also allows you to customize the number of extra forms. This controls the maximum number of forms to show in the inline. This doesn’t directly correlate to the number of objects, but can if the value is small enough. See Limiting the number of editable objects for more information. InlineModelAdmin.get_max_num() also allows you to customize the maximum number of extra forms. This controls the minimum number of forms to show in the inline. See modelformset_factory() for more information. InlineModelAdmin.get_min_num() also allows you to customize the minimum number of displayed forms. The template used to render the inline on the page. An override to the verbose_name found in the model’s inner Meta class. An override to the verbose_name_plural found in the model’s inner Meta class. Specifies whether or not inline objects can be deleted in the inline. Defaults to True. Specifies whether or not inline objects that can be changed in the admin have a link to the change form. Defaults to False. Returns a BaseInlineFormSet class for use in admin add/change views. See the example for ModelAdmin.get_formsets_with_inlines. Returns the number of extra inline forms to use. By default, returns the InlineModelAdmin.extra attribute. Returns the maximum number of extra inline forms to use. By default, returns the InlineModelAdmin.max_num attribute. Returns the minimum number of inline forms to use. By default, returns the InlineModelAdmin.min_num attribute. Override this method to programmatically determine the minimum number of inline forms. For example, this may be based on the model instance (passed as the keyword argument obj). By default, admin widgets for many-to-many relations will be displayed on whichever model contains the actual reference to the ManyToManyField. Depending on your ModelAdmin definition, each many-to-many field in your model will be represented by a standard HTML <select multiple>, a horizontal or vertical filter, or a raw_id_admin widget. However, it is also possible to replace these widgets with inlines. There are two features worth noting in this example. Firstly - the MembershipInline class references Group.members.through. The through attribute is a reference to the model that manages the many-to-many relation. This model is automatically created by Django when you define a many-to-many field. Secondly, the GroupAdmin must manually exclude the members field. Django displays an admin widget for a many-to-many field on the model that defines the relation (in this case, Group). If you want to use an inline model to represent the many-to-many relationship, you must tell Django’s admin to not display this widget - otherwise you will end up with two widgets on your admin page for managing the relation. Note that when using this technique the m2m_changed signals aren’t triggered. This is because as far as the admin is concerned, through is just a model with two foreign key fields rather than a many-to-many relation. In all other respects, the InlineModelAdmin is exactly the same as any other. You can customize the appearance using any of the normal ModelAdmin properties. When you specify an intermediary model using the through argument to a ManyToManyField, the admin will not display a widget by default. This is because each instance of that intermediary model requires more information than could be displayed in a single widget, and the layout required for multiple widgets will vary depending on the intermediate model. This simple example uses the default InlineModelAdmin values for the Membership model, and limits the extra add forms to one. This could be customized using any of the options available to InlineModelAdmin classes. Now your admin site is set up to edit Membership objects inline from either the Person or the Group detail pages. See the contenttypes documentation for more specific information. It is relatively easy to override many of the templates which the admin module uses to generate the various pages of an admin site. You can even override a few of these templates for a specific app, or a specific model. The admin template files are located in the contrib/admin/templates/admin directory. In order to override one or more of them, first create an admin directory in your project’s templates directory. This can be any of the directories you specified in the DIRS option of the DjangoTemplates backend in the TEMPLATES setting. If you have customized the 'loaders' option, be sure 'django.template.loaders.filesystem.Loader' appears before 'django.template.loaders.app_directories.Loader' so that your custom templates will be found by the template loading system before those that are included with django.contrib.admin. Within this admin directory, create sub-directories named after your app. Within these app subdirectories create sub-directories named after your models. Note, that the admin app will lowercase the model name when looking for the directory, so make sure you name the directory in all lowercase if you are going to run your app on a case-sensitive filesystem. To override an admin template for a specific app, copy and edit the template from the django/contrib/admin/templates/admin directory, and save it to one of the directories you just created. For example, if we wanted to add a tool to the change list view for all the models in an app named my_app, we would copy contrib/admin/templates/admin/change_list.html to the templates/admin/my_app/ directory of our project, and make any necessary changes. If we wanted to add a tool to the change list view for only a specific model named ‘Page’, we would copy that same file to the templates/admin/my_app/page directory of our project. Because of the modular design of the admin templates, it is usually neither necessary nor advisable to replace an entire template. It is almost always better to override only the section of the template which you need to change. And that’s it! If we placed this file in the templates/admin/my_app directory, our link would appear on the change form for all models within my_app. For those templates that cannot be overridden in this way, you may still override them for your entire project. Just place the new version in your templates/admin directory. This is particularly useful to create custom 404 and 500 pages. Some of the admin templates, such as change_list_results.html are used to render custom inclusion tags. These may be overridden, but in such cases you are probably better off creating your own version of the tag in question and giving it a different name. That way you can use it selectively. If you wish to change the index, login or logout templates, you are better off creating your own AdminSite instance (see below), and changing the AdminSite.index_template , AdminSite.login_template or AdminSite.logout_template properties. A Django administrative site is represented by an instance of django.contrib.admin.sites.AdminSite; by default, an instance of this class is created as django.contrib.admin.site and you can register your models and ModelAdmin instances with it. When constructing an instance of an AdminSite, you can provide a unique instance name using the name argument to the constructor. This instance name is used to identify the instance, especially when reversing admin URLs. If no instance name is provided, a default instance name of admin will be used. See Customizing the AdminSite class for an example of customizing the AdminSite class. Templates can override or extend base admin templates as described in Overriding admin templates. The text to put at the top of each admin page, as an <h1> (a string). By default, this is “Django administration”. The text to put at the end of each admin page’s <title> (a string). By default, this is “Django site admin”. The URL for the “View site” link at the top of each admin page. By default, site_url is /. Set it to None to remove the link. The text to put at the top of the admin index page (a string). By default, this is “Site administration”. 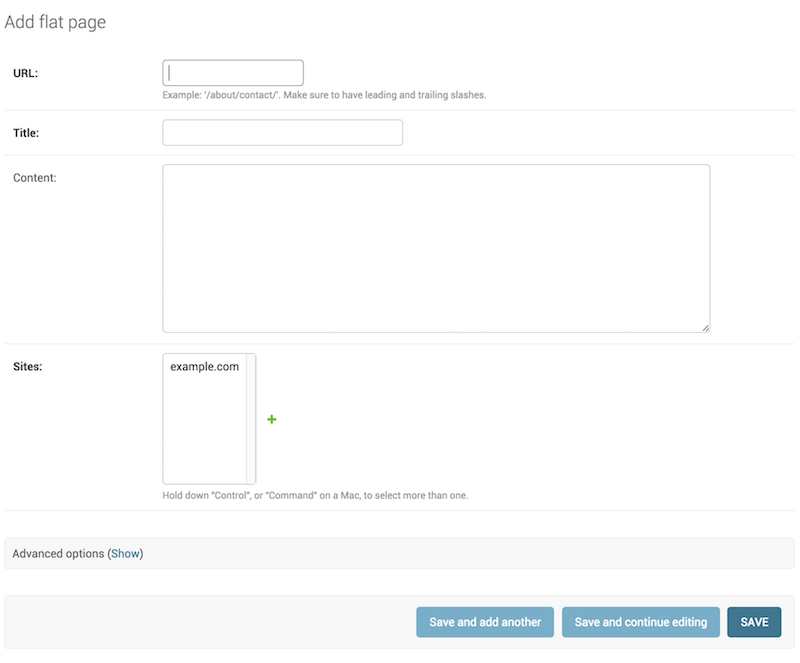 Path to a custom template that will be used by the admin site main index view. Path to a custom template that will be used by the admin site app index view. The string to use for displaying empty values in the admin site’s change list. Defaults to a dash. The value can also be overridden on a per ModelAdmin basis and on a custom field within a ModelAdmin by setting an empty_value_display attribute on the field. See ModelAdmin.empty_value_display for examples. Path to a custom template that will be used by the admin site login view. Subclass of AuthenticationForm that will be used by the admin site login view. Path to a custom template that will be used by the admin site logout view. Path to a custom template that will be used by the admin site password change view. Path to a custom template that will be used by the admin site password change done view. Returns a dictionary of variables to put in the template context for every page in the admin site. The request argument and the has_permission variable were added. The available_apps variable was added. Returns True if the user for the given HttpRequest has permission to view at least one page in the admin site. Defaults to requiring both User.is_active and User.is_staff to be True. The last step in setting up the Django admin is to hook your AdminSite instance into your URLconf. Do this by pointing a given URL at the AdminSite.urls method. It is not necessary to use include(). In previous versions, you would pass admin.site.urls to include(). If you’d like to set up your own admin site with custom behavior, you’re free to subclass AdminSite and override or add anything you like. Then, simply create an instance of your AdminSite subclass (the same way you’d instantiate any other Python class) and register your models and ModelAdmin subclasses with it instead of with the default site. Finally, update myproject/urls.py to reference your AdminSite subclass. Note that you may not want autodiscovery of admin modules when using your own AdminSite instance since you will likely be importing all the per-app admin modules in your myproject.admin module. This means you need to put 'django.contrib.admin.apps.SimpleAdminConfig' instead of 'django.contrib.admin' in your INSTALLED_APPS setting. It’s easy to create multiple instances of the admin site on the same Django-powered website. Just create multiple instances of AdminSite and root each one at a different URL. AdminSite instances take a single argument to their constructor, their name, which can be anything you like. This argument becomes the prefix to the URL names for the purposes of reversing them. This is only necessary if you are using more than one AdminSite. Just like ModelAdmin, AdminSite provides a get_urls() method that can be overridden to define additional views for the site. To add a new view to your admin site, extend the base get_urls() method to include a pattern for your new view. Any view you render that uses the admin templates, or extends the base admin template, should set request.current_app before rendering the template. It should be set to either self.name if your view is on an AdminSite or self.admin_site.name if your view is on a ModelAdmin. In previous versions of Django, you had to provide the current_app argument to RequestContext or Context when rendering the template. (This assumes you’ve added the admin at admin/ and requires that you put the URLs starting with ^admin/ before the line that includes the admin app itself). The presence of the admin_password_reset named URL will cause a “forgotten your password?” link to appear on the default admin log-in page under the password box. The LogEntry class tracks additions, changes, and deletions of objects done through the admin interface. The date and time of the action. The user (an AUTH_USER_MODEL instance) who performed the action. The ContentType of the modified object. The textual representation of the modified object’s primary key. The object`s repr() after the modification. The type of action logged: ADDITION, CHANGE, DELETION. The detailed description of the modification. In the case of an edit, for example, the message contains a list of the edited fields. A shortcut that returns the referenced object. When an AdminSite is deployed, the views provided by that site are accessible using Django’s URL reversing system. These named URLs are registered with the application namespace admin, and with an instance namespace corresponding to the name of the Site instance. This will find the first registered instance of the admin application (whatever the instance name), and resolve to the view for changing poll.Choice instances in that instance. For more details, see the documentation on reversing namespaced URLs. The action in the examples above match the last part of the URL names for ModelAdmin instances described above. The opts variable can be any object which has an app_label and model_name attributes and is usually supplied by the admin views for the current model. If the user is logged in, is a staff member (User.is_staff=True), and is active (User.is_active=True), execute the view normally. Otherwise, the request will be redirected to the URL specified by the login_url parameter, with the originally requested path in a query string variable specified by redirect_field_name. For example: /admin/login/?next=/admin/polls/question/3/.